Written by Rilogator on November 30th, 2018. After an amusing story cinematic and some brief tutorials, you’re well into the game. The cinematic itself depicts the protagonist comically teleporting to the future. The tutorials are simple button prompts with symbols vaguely describing actions. They work with Cybarian‘s simple gameplay since you can only jump and attack at the beginning of the game, while more advanced moves are unlocked after defeating bosses. The twist is that your attacks have to be precisely timed in order to execute a combo, or else the titular Cybarian stumbles and leaves himself open to enemy attacks. Health is in short supply and incredibly difficult to acquire in levels. Thankfully, enemies telegraph their moves clearly and it’s rare to be in a situation where you don’t know what an enemy will do before you approach it. Without checkpoints, however, dying late in a level means going through content you’ve long since conquered, with failure only happening when you lose your patience. 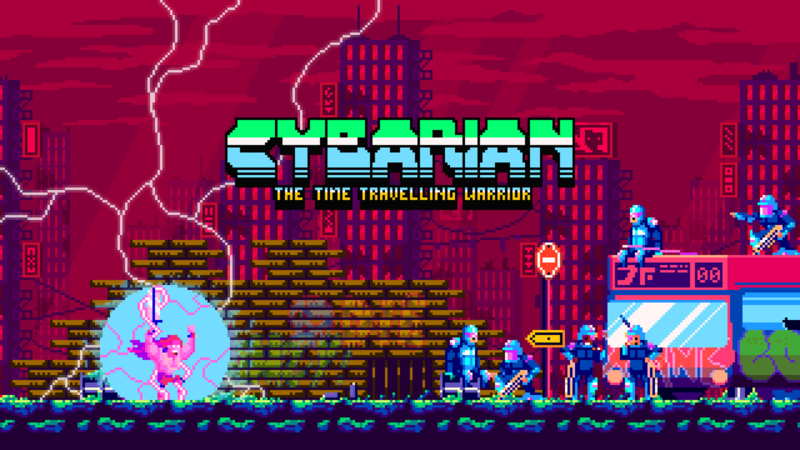 It’s generally not a compliment to call a game a test of patience, but when you take things slow, you’ll find that Cybarian is not overly difficult. The game’s visuals are brightly colored, reminiscent of ’80s neon color palettes. A retro-style CRT television filter is applied to the entire game which adds a lot to the aesthetic. It never feels distracting or out of place given the overall tone of the game. Adding to which is the fantastic music, which is as classic chiptune as you can get. The graphics themselves render all the characters as very square and stylized figures which lends itself well to anticipating enemy movements. 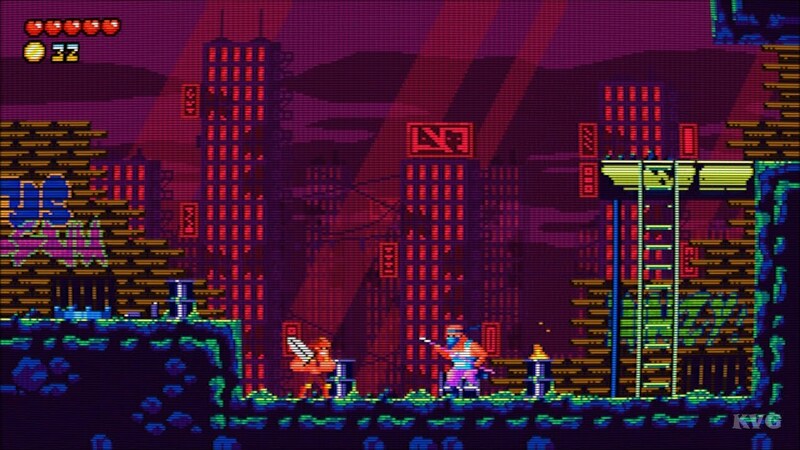 The backgrounds are striking and each level has a unique feel to it thanks to a diverse use of color, though they never overwhelm the characters in terms of visual importance. As a whole, Cybarian is a thoroughly enjoyable game. 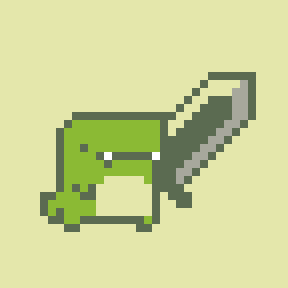 Levels are diverse, both in their aesthetics and enemy design adding variety as you progress. There are no stats or unlocks to grind except for more maneuvers, so it’s just down to you and the controller. If game over screens don’t scare you off, a sizable challenge broken down into bite-sized chunks is on offer. It’s the perfect game for play during some downtime at work or while you watch a show. The curiosity of the next unique stage or game-changing power-up keeps you going, while clearing screens with increasing efficiency holds your immediate attention. Graphics: Charming and distinct sprites delight your eyes and convey vital information. Sound: Eighties synthetic music brings you right back to the golden era of arcades. Replay Value: You'll be replaying this game a lot, but that's not a bad thing. Quick and easy for an experienced player. Gameplay: Very basic mechanics with a tight window for success make this a game worth getting good at. Progression: The lack of checkpoints can be very daunting and could have been offered as an optional mode rather than the default. Final Rating: 7/10. Cybarian is an echo of classic arcade beat 'em ups designed to eat quarters, both in their challenging difficulty and addicting gameplay. The curiosity of the next unique stage or game-changing power-up keeps you going, while clearing screens with greater efficiency each time holds your immediate attention.